The Euronews agency has a special rubric called “No comment” where they show video news without commentary as the picture speaks for itself when something dramatic, awful or really amazing is shown. I think the above diagram also speaks for itself and it shows the drama where the gold just smashed all of the fiat currencies as none of them could escape. None! The best among the losers (quite ironic) are the Canadian dollar and Japanese yen, both with the minimum losses compared to others at minus 5%. Amazing, but Loonie (nickname of CAD) was a last year’s ultimate loser and this year it has finished at the top! 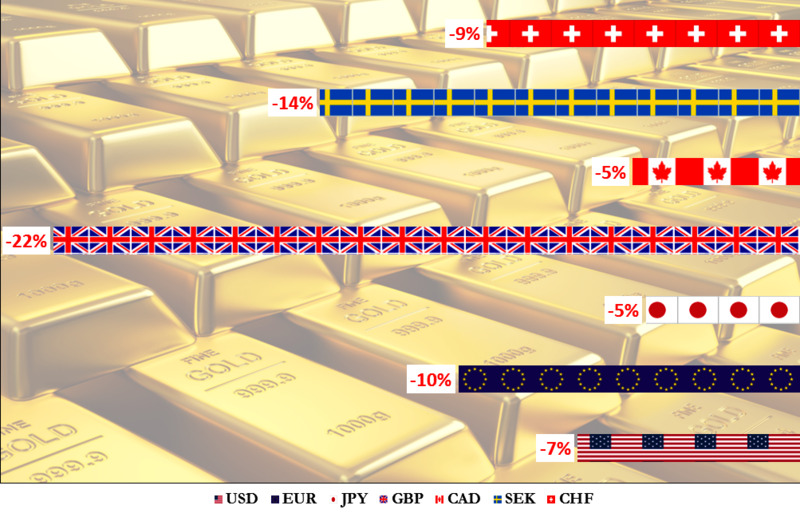 The top currency (USD) ranked second with minus 7% keeping the same position compared to 2015 result; in 2014 it was the first. The Swissy took the fourth place with minus 9%. The (EUR) finished just behind it with minus 10%, if you think it’s too much read further. The group of the top losers called “beyond the horizon” includes two currencies, the Swedish krona with a huge loss of minus 14%. Krona was in a worse position in 2014 with minus 18% and the last place. Last year it was almost flat with a 2% gain. And the top loser among losers, is the British pound with a jaw-dropping minus 22% loss year-to-date completes the list. The prey of “Brexit” was never so bad for the last three or even more years. This is the classic evidence of the life rule: when you divorce – you lose a decent part of your assets. Although there is a good chance that the devalued pound could bring trade benefits to The United Kingdom as the whole world is engaged in a currency war to win trade advantages making goods cheaper for foreigners. The chart below shows the perspective of the British pound against the gold. The outstanding weakness of the GBP this year helped gold to break the orange falling trendline. After the Brexit vote, the metal rocketed further approaching the levels unseen since 2013. The gold topped in October at the £1075 level just below the 78.6% Fibonacci retracement level (highlighted in black). The upside dynamics was so impressive that the market could see the mirage of the all-time high at the £1195 level. The optical illusion was dispelled by £100+ sized red November candle, which brought the gold to the blue rising trendline. This month that support was finally broken confirming the ongoing correction. We should watch closely after the reaction of Fibonacci retracement levels highlighted in red (counter move). As long as we are above the orange trendline (£790 level) the momentum would be bullish. Currently the game is within the following range – 50% Fibo level at the £881 mark at the downside and the blue trendline resistance (former support) at the £990 level. This is my 100th post in this blog, this jubilee post as always I dedicate to all of you for reading my analysis from 2014! As if that somehow really matters and makes it all better to those being mauled by a secular bear in metals land. Especially those who have lost 50-90% in mining stocks, the same touts just keep pumping like nothing bad has happened. That is never how bear markets end.